Seeking a state of presence: The most important things in life are our health and happiness. Yet most of us are neither healthy nor happy. We have been led to believe that if we think ahead and make the right choices, we can manifest our dreams. Yet despite our best efforts, we still have more disease and discontent than ever before. Is it possible that our essential ideas about life are flawed? Can we learn how to get into the zone or a flow state? Is light the key to finding a state of presence? Living in the light: We are all aware of the impact of sunlight on a plant's growth and development. But few of us realize that a plant actually "sees" where light is emanating from and positions itself to be in optimal alignment with it. This phenomenon, however, is not just occurring in the plant kingdom -- humans are also fundamentally directed by light. The intersection of science and spirituality: In Luminous Life, Dr. Jacob Israel Liberman integrates scientific research, clinical practice, and direct experience to demonstrate how the luminous intelligence we call light effortlessly guides us toward health, contentment, and a life filled with purpose. 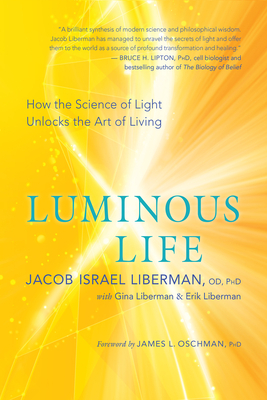 If you have read Barbara Brennan's Hands of Light or Light Emerging, you're going to love Jacob Liberman's Luminous Life. Dr. Jacob Israel Liberman is a pioneer in the fields of light, vision, and consciousness and the author of Light: Medicine of the Future and Take Off Your Glasses and See. He has developed numerous light and vision therapy instruments, including the first FDA-cleared medical device to significantly improve visual performance. A respected public speaker, he shares his scientific and spiritual discoveries with audiences worldwide. He lives on Maui, Hawaii. Erik Liberman is an actor, writer, and director living in New York City.Gina Liberman is a poet, counselor, and artist living in Charleston, South Carolina.